Kristine Lippire (second from left), assistant professor of visual arts at California Baptist University, is surrounded by students that created a mural at Tomas Rivera Elementary school in Riverside for Lippire’s ART 300 class. The group stands below a portrait of their project. 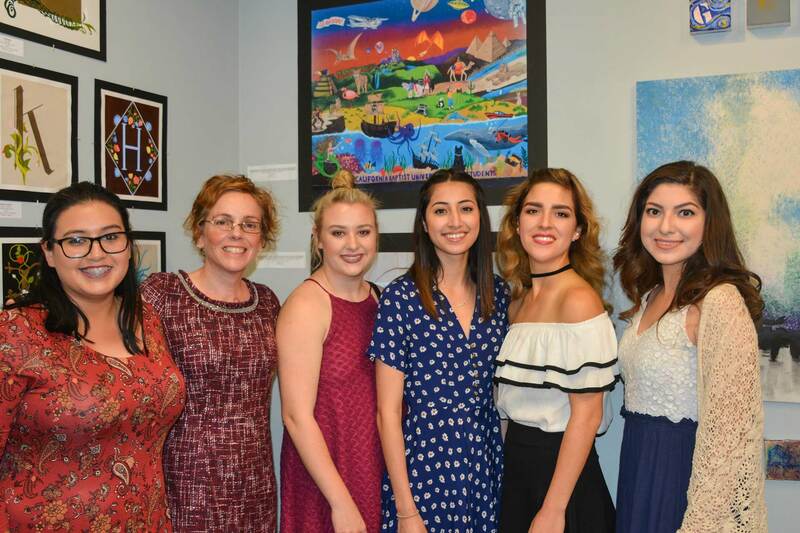 Riverside, Calif. (March 17, 2017) – Art enthusiasts filled the California Baptist University Gallery in downtown Riverside during the opening reception for the fifth annual Honors Exhibit on March 16. A variety of CBU students’ work, which were produced in visual arts courses, are on display at the exhibit. Visual arts faculty selected the artwork, featuring mixed media, paintings, drawings and sculptures. The opening reception also included an inaugural awards ceremony that highlighted excellence within the students’ work. Kristine Lippire, assistant professor of visual art, said the awards ceremony is the first of a yearly recognition of excellence within the visual arts program. Sandoval, a visual arts junior, said that she appreciated the promotion of an art culture on campus. The exhibit runs through March 25 at CBU’s Gallery located at 3737 Main St., Suite 101 in downtown Riverside. The display is open Tuesday – Saturday from noon – 8 p.m.